The Hillman Group 43980 .093 X 2-5/16 Hitch Pin Clip, Stainless Steel, 10-Pack by The Hillman Group at The Mirror Project. MPN: 43980. Hurry! Limited time offer. Offer valid only while supplies last. Also known as a hairpin cotter or R-clip, this hitch pin is used to secure the ends of round shafts most commonly on tractors or heavy equipment. 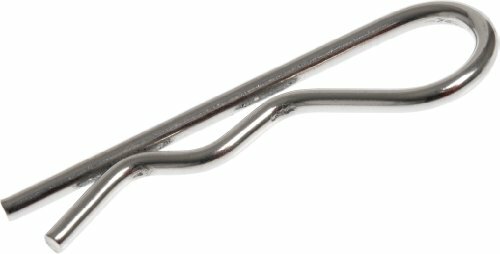 Also known as a hairpin cotter or R-clip, this hitch pin is used to secure the ends of round shafts most commonly on tractors or heavy equipment. Insertion into a hole depends on the straight leg entering the hole and the curved leg pressing down upon outer diameter of the shaft. Compared to cotter pins, hitch pins are easier to remove and are reusable.